Union members hold up placards as they join a protest of several thousand people demanding jobs outside City Hall in Los Angeles in 2010. Breathe a sigh of relief. The jobs recovery is still on track. U.S. employers added 248,000 jobs in September, the most since June, the Bureau of Labor Statistics said Friday. What’s more, August wasn’t quite as lousy as last month’s initial jobs report suggested: The government now says the economy added 180,000 jobs in August and 243,000 in July, a combined 69,000 better than previously thought. Friday’s figures don’t necessarily indicate an acceleration. The economy has added 2.6 million jobs over the past year; that pace has picked up a bit over the year, but it’s still too soon to know whether the economy has at last found a new gear. What is clearer, however, is that August’s weaker growth was a fluke, not a real slowdown. Hence the sigh of relief. Friday’s report also showed the unemployment rate falling to 5.9 percent in September, the first time it’s been under 6 percent since 2008. Other measures of joblessness are also falling: Fewer than 700,000 people report that they’ve given up looking for work because none is available, down from more than a million four years ago; the number of long-term unemployed, those out of work more than six months, is now under 3 million for the first time during the recovery; and layoffs recently hit a 10-year low. 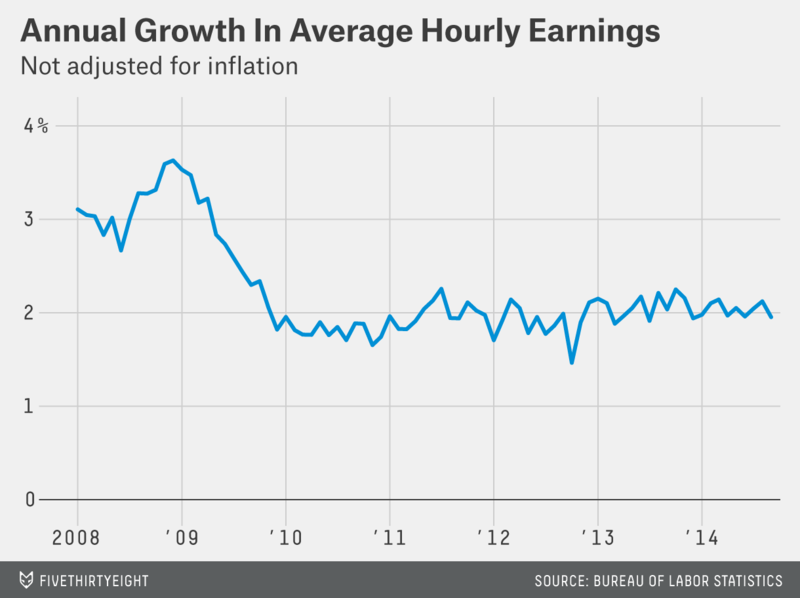 Yet there is a key piece of evidence that the jobs recovery remains incomplete: Wage growth remains anemic — at best. Average hourly earnings fell slightly in September and are up less than 2 percent over the past year. That suggests companies can still attract and retain workers without offering higher pay — a sign there are still plenty of workers available. Another sign: More than 7 million Americans are working part time because they can’t find full-time work. Federal Reserve Chairwoman Janet Yellen has cited that figure as a key reason that the Fed needs to keep trying to boost the economy by keeping interest rates low. Friday’s report, then, indicates that the job market is still recovering but isn’t yet fully recovered. That’s pretty much where we’ve been for the past three years. 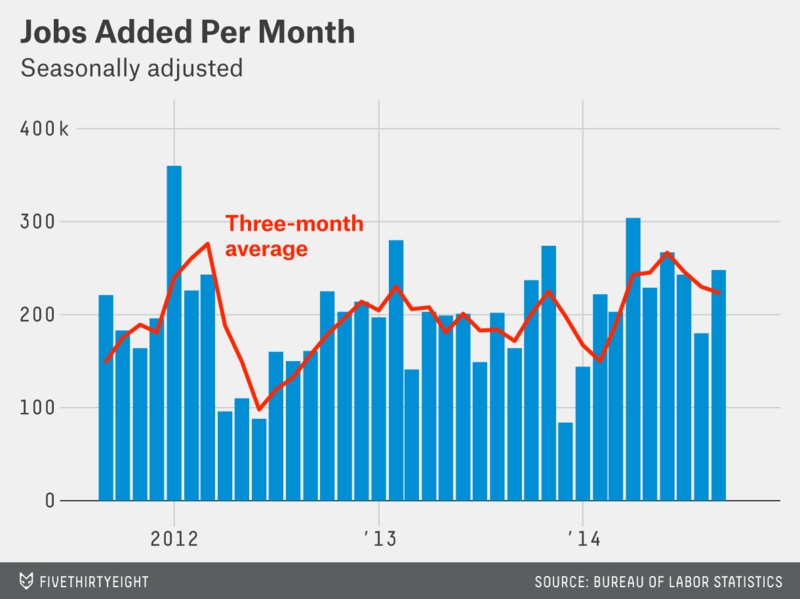 But at least September’s rebound should ease fears the jobs recovery is losing steam. Unemployment rate down for “good” reasons: As regular readers know, a drop in the unemployment rate doesn’t necessarily indicate good news. That’s because the government only counts people as unemployed if they’re actively looking for work. 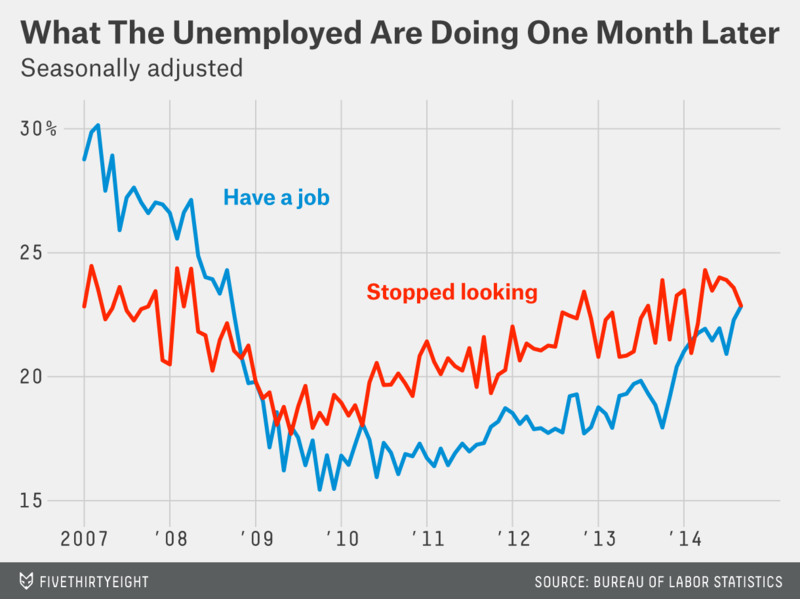 If people stop looking, the unemployment rate will fall, but not because people found jobs. This time, though, the drop is good news. The government each month asks unemployed people why they’re out of work — did they lose a job, quit voluntarily or are they entering or re-entering the job market (for example, after graduating from school)? 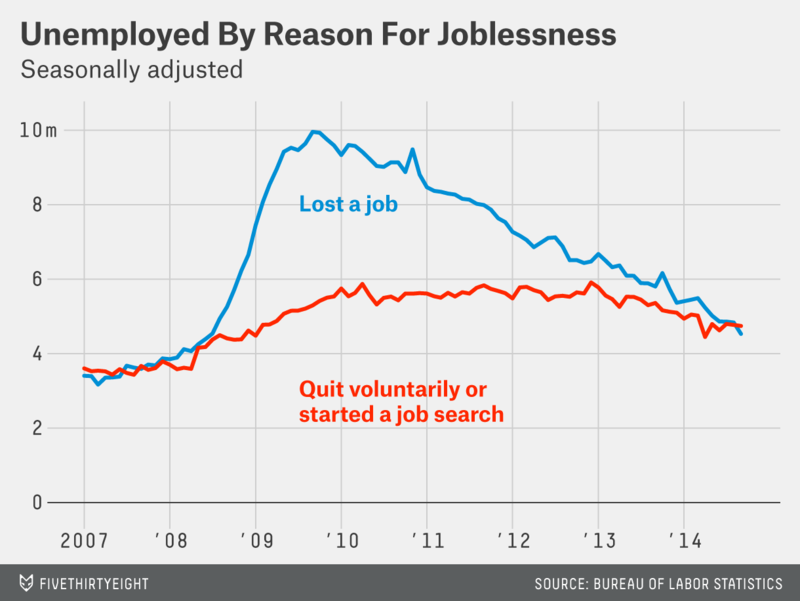 For the first time in the recovery, job losers make up less than half the jobless, meaning most of the unemployed either quit their jobs or are deciding to start (or restart) their job searches. That’s a sign of confidence in the economy. Concerns over job quality: One of the persistent questions in the recovery has been whether the economy is creating enough well-paying jobs. The monthly employment reports give only a limited window into that question — they don’t break down hiring by how much the jobs pay or by job title — but we can get a hint by looking at which industries are adding jobs. In September, a quarter of job growth came from the typically low-paying retail, restaurant and hotel sectors. The better-paying manufacturing and construction industries, meanwhile, posted only modest gains. Better odds for the unemployed: For virtually the entire recovery, more unemployed workers have left the labor force each month than have found jobs. In September, the two figures were almost exactly equal: 23 percent of jobseekers found jobs, and 23 percent stopped looking (the rest remained unemployed). Watch for revisions: The upward revision to August’s job gains was in some ways more significant than the September figure. That’s not only because it should ease fears of a cooling job market but also because the revised figures are simply more reliable than the preliminary numbers; they’re based on more complete data. That also means it’s wise to take the September numbers with a grain of salt. They’ll be revised at least twice before they’re final. And as Friday’s report shows, those revisions can go in either direction.